The Casio PRW-2500T-7CR Pro Trek’s claim to fame lies in the impressive range of tools and instruments that come packed within this computer watch. This watch may appeal to the scientifically minded outdoors-person and find utility in professions such as geology, meteorology and geographical mapping. We believe the model’s variety of sensors and instruments are ideal for fine measurement taking and position tracking, as their design was overseen by a team of meteorologists to ensure quality. Whether you are a military professional or an outdoor enthusiast, at some point or another you are likely to undertake a long expedition. The PRW-2500T-7CR is part of Casio’s Pro Trek range, which as its name suggests, is a line Casio designed to cope with long excursions. At 4 ounces, this watch is a little weightier than some of its competitors. However, it has an arrangement of ringlets on the back casing to improve both comfort and grip. When viewing stock photos of this watch, you might think that the seemingly bulky body would look gaudy and garish on your wrist. However, we think that, though the watch face may be large, its smooth and tasteful design does not come across as show-offish, but rather gives the impression of quiet confidence. The presentation of information on the display is very intuitive, arranged in an orderly manner, and available at a glance. If you should want to calibrate and configure some of the more advanced options this watch has to offer, the menu system is relatively easy to navigate, which is a good job too as there are a lot of options. 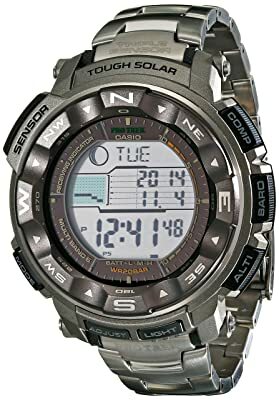 The manual that comes with this watch is around an inch thick, which is a testimony to the depth of functionality Casio has crammed into this wrist-top computer. As with many of Casio’s mid-range military watches, the Casio PRW-2500T-7CR has atomic timekeeping technology, which for US citizens, receives calibrating radio waves from Fort Collins to ensure that the timepiece remains accurate. This feature is important for military professions where synchronization with fellow teammates is important. As this Pro Trek model is designed to excel on long expeditions, it was essential that Casio incorporated a weather forecasting system to warn the user of approaching storms. The barometer takes a reading once every two hours and plots this data on a trend graph, enabling the user to assess weather conditions at a glance. When the barometer button is depressed, a traditional mercury reading is presented alongside a temperature display. This watch comes with many of the instruments and sensors you might expect from a high-tech watch such as an altimeter, moon phase data/tidal data (useful for water-related activities), sunrise/sunset information, and much more. The altimeter has some nice functionality to it, allowing you to set the reading from sea level and store data regarding your ascent/descent for later analysis. The Casio PRW-2500T-7CR is also solar powered and Casio say it can remain charged for up to 5 months in the absence of light. But if that’s not enough, it also has a power saving/sleeper mode with remaining battery life displayed on the home screen. We believe Casio PRW-2500T-7CR Pro Trek to be a durable, rugged powerhouse that excels in technology and sophistication. One downside to this watch is that it may not be suitable for stealthy military purposes due to the conspicuous nature of its silver stainless steel casing.